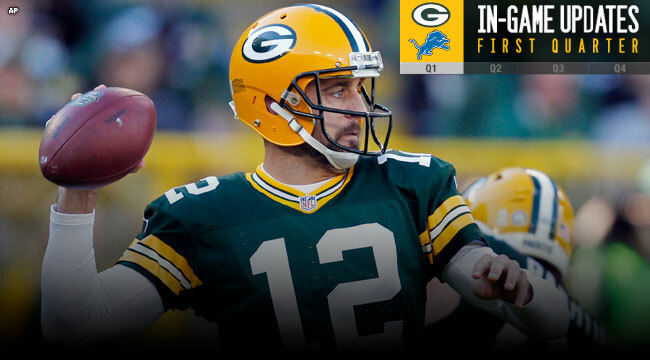 GREEN BAY — The Packers held a 3-0 lead over the Lions following one quarter of play at sun-drenched Lambeau Field on Sunday. The Lions won the toss and elected to defer their choice. The Packers began their first possession of the game at their 17-yard line. They opened in no-huddle and Aaron Rodgers completed four consecutive passes, leaving the Packers with a third-and-1 at the Packers 48. James Starks converted the third down with a run to midfield. Green Bay’s drive stalled and Mason Crosby booted a 44-yard field goal, though not without drama. The ball caromed off the left upright, 3-0, with 10:06 to play in the first quarter. With 6:24 to play in the quarter, the Packers began a drive at their 16-yard line. Rodgers completed an 18-yard pass to Davante Adams to the Packers 40-yard line. On third-and-9, Randall Cobb dropped a pass that would’ve produced a sizable gain, or maybe even more. Matt Stafford’s first completion also gained the Lions’ first first down. Curiously, the Lions remained committed to running the football, despite being last in the league in rushing.